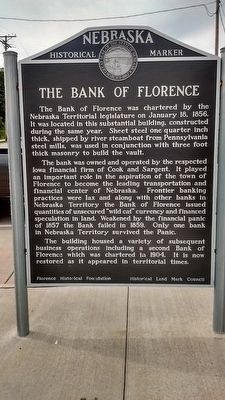 The Bank of Florence was chartered by the Nebraska Territorial legislature on January 18, 1856. It was located in this substantial building, constructed during the same year. Sheet steel one quarter inch thick, shipped by river steamboat from Pennsylvania steel mills, was used in conjunction with three foot thick masonry to build the vault. The bank was owned and operate by the respected Iowa financial firm of Cook and Sargent. 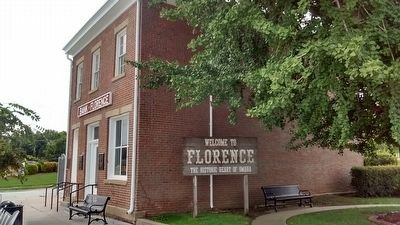 it played an important role in the aspiration of the town Florence to become the leading transportation and financial center of Nebraska. Frontier banking practices were lax and along with other banks in Nebraska Territory the Bank of Florence issued quantities of unsecured "wild cat" currency and financed speculation in land. Weakened by the financial panic of 1857 the Bank failed in 1859. Only one bank in Nebraska survived the Panic. 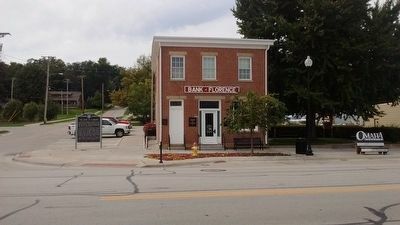 The building housed a variety of subsequent business operations including a second Bank of Florence which was chartered in 1904. It is now restored as it appeared in territorial times. Location. 41° 20.238′ N, 95° 57.65′ W. Marker is in Florence, Nebraska, in Douglas County. Marker is at the intersection of 30th Street and Willit Street, on the left when traveling north on 30th Street. Touch for map. Marker is in this post office area: Omaha NE 68112, United States of America. Touch for directions. Other nearby markers. At least 8 other markers are within walking distance of this marker. Mormon Pioneer Memorial Bridge (here, next to this marker); From Indian Lands to the Golden Gate (within shouting distance of this marker); A Little Town That Dreamed of Greatness (within shouting distance of this marker); Winter Quarters (about 600 feet away, measured in a direct line); The Mormon Pioneer Trail (approx. 0.4 miles away); A Meeting House for the Saints (approx. 0.4 miles away); The Florence Mill (approx. 0.4 miles away); a different marker also named The Florence Mill (approx. 0.4 miles away). Touch for a list and map of all markers in Florence. More. Search the internet for The Bank of Florence. Credits. This page was last revised on June 16, 2016. This page originally submitted on November 10, 2015, by Tom Bosse of Jefferson City, Tennessee. This page has been viewed 247 times since then and 7 times this year. Photos: 1, 2, 3. submitted on November 10, 2015, by Tom Bosse of Jefferson City, Tennessee. • Bill Pfingsten was the editor who published this page.